Technology, Computer Science, Math, Music, Cats, Photography, Design... just about Everything. I chose to go with SmugMug instead of Flickr mainly because of SmugMug's image protection and privacy controls. Although the Flickr community is a lot more active than SmugMug's, I prefer keeping my photos safe with SmugMug's size restriction and right-click protection. 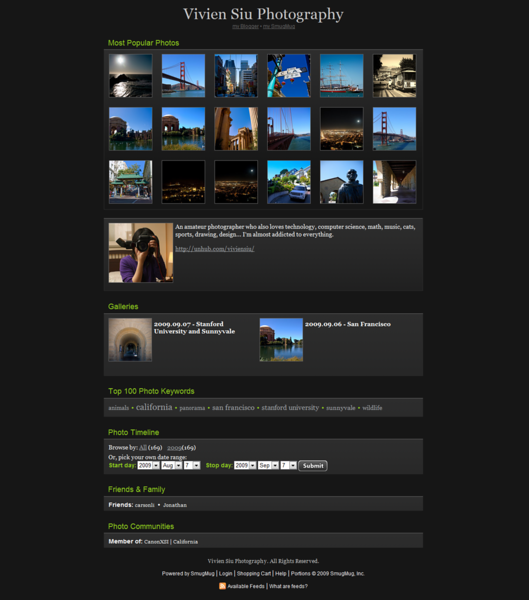 I also wanted to have the ability to customize my site (a feature that Flickr lacks). However, I will probably make use of the free Flickr basic account to upload low resolution version of my photos and point them to SmugMug to gain some audience. SmugMug 14-day trial - it's credit card free. They're currently giving out free SmugMug camera straps for SmugMug members, too! So where is my SmugMug site?